KATHMANDU, July 13: Lawmakers have urged the government to take carrot and stick approach for bringing remittances into the country through formal channel and discouraging informal remitting channels like hundi. Speaking at a meeting of the parliamentary Finance Committee on Thursday, they called upon the government to bring incentives for encourage workers abroad to use banking channel to remit their savings, and punish those sending money home through informal remitting channels. Members of the parliament also expressed worries over the slowdown in remittance growth rate in recent years partly due to growing use of informal channels to remit money home, and recent turmoil in the Gulf countries. Any significant drop in remittances, which equals to 30 percent of the country's GDP, will hit the country's foreign exchange reserve and balance of payment (BOP) situation. While there is no data to suggest how much money sent by workers enter the country through informal channels, government officials estimate that such amount could be higher than the remittances that the country receives through the formal channel. Parliamentarians have called for more effective measures to ensure that remittances enter into the country only through formal channel. Speaking at the meeting, Surendra Panday, a member of the Finance Committee, said that the government should provide incentive to attract remittances through formal channel and punish those remitting money through informal channels. “To get the remittances through system, we should offer incentives. The cost of sending money from formal channel should not be higher compared to informal channels. There could be incentives like higher interest rates on savings coming through formal channel, cheaper loans to workers using formal channel and government subsidy on remittance cost, among others,” said Panday. Shakti Basnet, another member of the house panel, said that government was not serious about curbing the use of informal channel for remittances. “We started discussion on the issue years ago, and we are still discussing it. The government has not launched any effective program to encourage workers to use formal channel,” said Basnet. 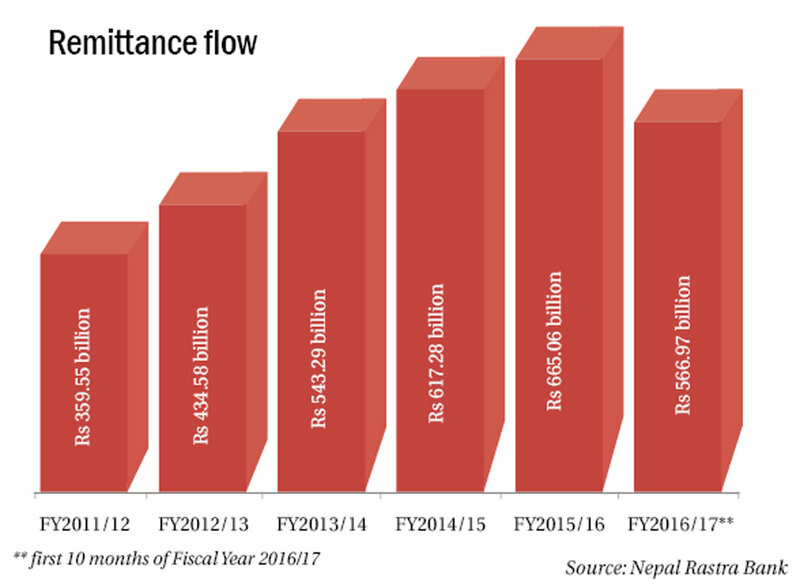 Government officials say that South Korea is at the forefront in terms of remitting money to Nepal through informal channels like hundi. Observers call for more stringent provision to make it mandatory for workers to open their bank account here before leaving the country for overseas jobs. “South Korea is the labor receiving country for Nepal based on government to government agreement. It's frustrating to see that the highest amount of money coming from informal channels is from South Korea. The government should introduce a provision in the agreement whereby workers will be required to channelize their money to Nepal directly through banking channel,” Chandra Prasad Dhakal, president of IME Group that operates IME -- a remittance company, said in the meeting. Along with raising awareness among migrant workers, Finance Secretary Shanta Raj Subedi said that the government was providing discount on land registration fee for workers using formal channels and foreign employment bonds, among other policies and programs, to encourage the use of formal channel. He, however, said that the subsidy on money transfer cost could be too costly for the government. Subedi further added that the government has upped the efforts to crackdown on informal and illegal remitting channels like hundi. According to Subedi, the government filed 10 cases against people involved in hundi in the last fiscal year, while 18 cases have been filed against them in the current fiscal year. Also speaking at the meeting, Minister for Labor and Employment, Farmulha Mansur, said that the ministry was bringing a rule that require overseas job aspirants to have two bank accounts before flying abroad. “They can directly transfer their money for saving purpose in one account, while the other account will be opened on their family member's name could be used to transfer money for household expenses. This mandatory provision will help in increasing the use of formal channel,” Mansur added. Acting Governor of Nepal Rastra Bank (NRB), Chintamani Shiwakoti, told the meeting that workers mostly from India, South Korea and UAE have been using informal channels to remit their money home. Other members of the Finance Committee urged the government to bring both incentivizing and mandatory measures for workers to use formal channel for repatriating their earnings to the home country. Members of the parliament have also expressed their worries over slowdown in remittance growth rate in recent years. They say that the government should be serious about finding a solution before the situation becomes serious. 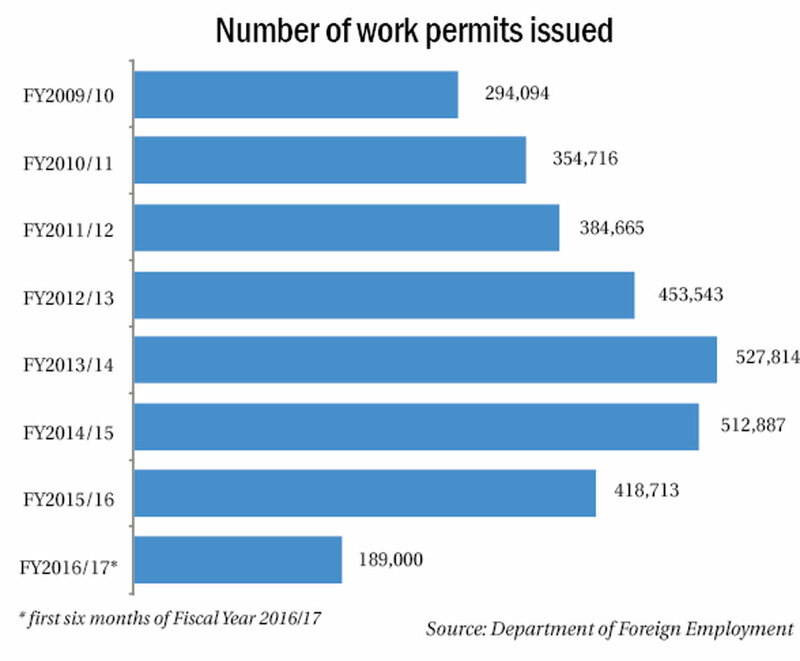 The drop in the number of outbound workers, turmoil in Gulf countries and lack of new destinations for foreign employment could pose a threat to the economy, they say. “Remittance growth is falling due to drop in outbound workers and turmoil in Gulf countries. Worse still, we have not even made any preparation to find another destination as an alternative,” Finance Committee Member Panday said. 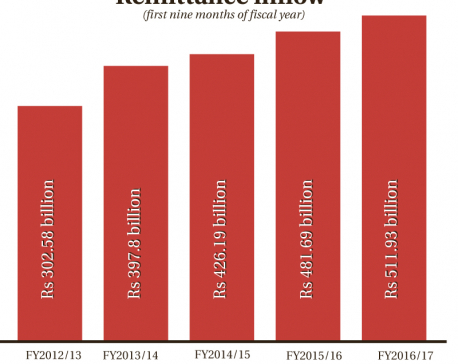 According to the central bank's data, remittances flow increased by only 5.2 percent to Rs 566.97 billion in the first 10 months of the current fiscal year compared to a growth of 10.2 percent in the corresponding period of the previous fiscal year.“If situation worsens further and remittance flow continues to plunge, our foreign exchange reserve and balance of payment positions might be hit. It could create a situation when we have to take loans from the International Monetary Fund (IMF),” Panday, who is also a former finance minister, said. Remittance is one of the main sources that has kept foreign exchange reserve and balance of payment in a surplus situation.